Winter is not over yet. 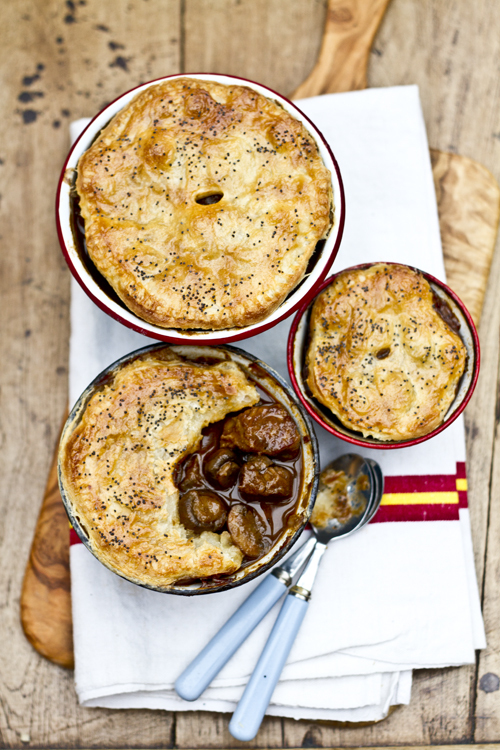 Before we go a little too crazy with health kicks after holiday excesses, lets make a few more stews, pies and mash. These dark January and February months require sturdy comfort food to pull us through it. What better way is there to spend a Sunday than making a slow-cook dinner and opening (dare I say) a bottle of red wine? Perhaps you do make that extra trip to the gym or yoga class, but don’t stop cooking. My favorite cold weather dish is pot pies. Any stew-like base can be used and then topped off with flaky puff pastry. I’ve chosen one of the recipes in Meals in heels, which used chunks of beef slowly braised in Guiness beer along with buttons mushrooms. This classic Irish filling needs time to become tender, so you may want to make the stew the day before. Feel free to add any of your favourite winter vegetables such as cubed parsnip, turnip or carrot in the last 15 minutes of cooking to make it more of a one pot meal. Preheat oven to 200ºC (400ºF/Gas 6). Heat the remaining oil in the pan. Add the onion and cook for 5 minutes or until softened. Add the mushroom and cook for 5 minutes or until lightly browned. Add the beef, stock, Guinness, tomato paste, vinegar and Worcestershire sauce to the pan, bring to the boil, then reduce heat to very low, cover and simmer for 60 minutes or until beef is fork tender. 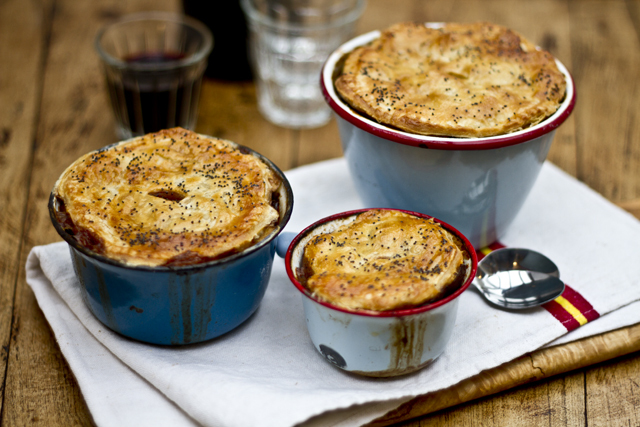 Divide among six 12 cm (41/2 inch), 400 ml (14 fl oz) capacity ramekins or ovenproof bowls and cool for 20 minutes. Roll out the pastry to 5 mm (14 inch) thick and cut into 6 squares to fit over the bowls. Brush the rims of the bowls with a little beaten egg, lay the pastry over and press to seal. Make a small slash in the pastry with a knife and brush with a little more beaten egg. Bake for 20 minutes or until golden and puffed. That’s making me feel so hungry! Made this today. Delicious! The ramekins servings are a great idea, although my husband ate two of them. Thanks for sharing. Wow. I love the idea of adding Balsamic. I have my own guinness stew recipe, but never thought to add balsamic! Love it! Thanks! These look TO-DIE-FOR good! 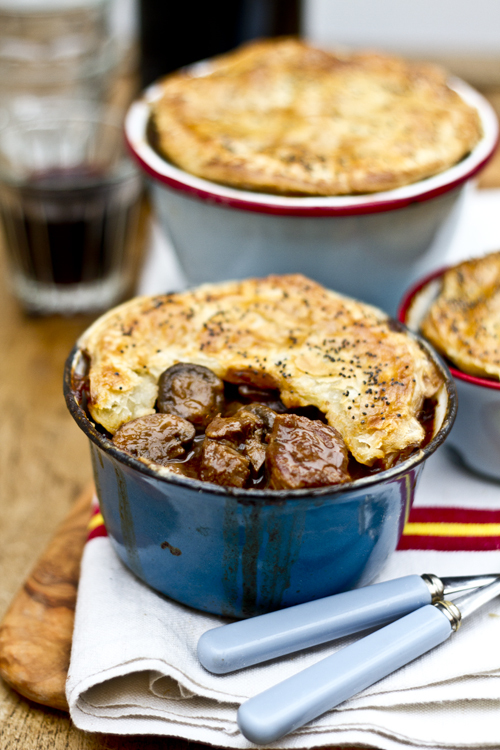 I love mushrooms and I love wintery “stews, pies, and mash.” YUM!